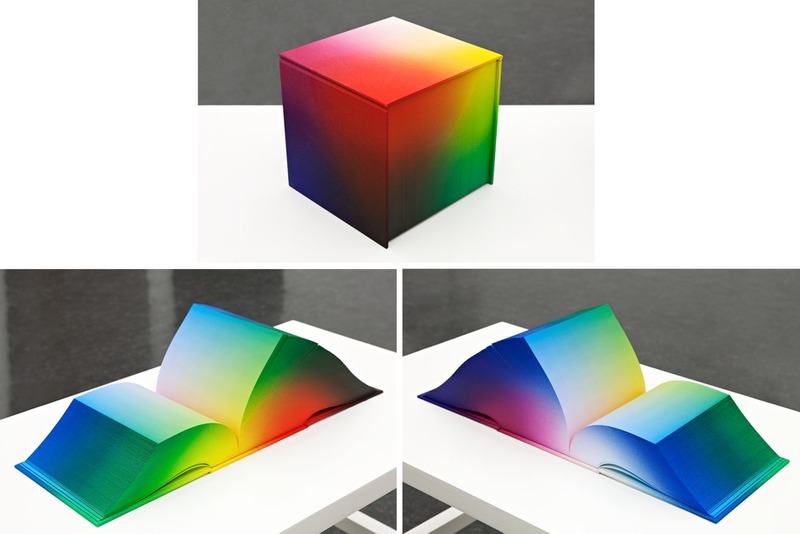 It's called RGB Colourspace Atlas, and is a physical, printed book of what it implies is the whole RGB colour space. Is there an existing commercially available ink set that could print something like this? Naturally, CMYK printers couldn't do it because they don't cover the full RGB gamut - they couldn't reach the pure reds, greens and blues. And for spot colours, mixing and blending them is a Bad Idea - not what they're normally designed for - so it's hard to see how they could be used in the complex hue gradients. Could a hexachrome (CMYKOG, Cyan/Magenta/Yellow/Black/Orange/Green) ink set manage this? Or CMYKRB (.../Red/Blue)? Or anything else? The site doesn't say which RGB gamut, so the question has a bit of a hole in it. HP doesn't give any specs and makes no claims that I know of (I just checked again on a couple of their spec sheets) in relation to reproducing an sRGB or Adobe RGB gamut. They do, justifiably, guarantee accurate reproduction of most of the Pantone colors even without using their offline ink mixer. They do offer Photo Cyan and Photo Magenta, essential for photographic reproduction (which speaks to the RGB color space, of course). I'll be visiting one of the best digital printing plants in the world a couple of weeks from now and will check. All their digital work is on Indigo, and HP uses them to showcase what the presses can do, to potential buyers. If anybody knows, they will. The only printer I know of that claims to reproduce the Adobe 1998 RGB gamut in full is the Canon Pro9000 (not the 9500, which uses pigment inks). That requires the right ICC profile and the right paper. I've not tested that claim scientifically, but I can say that it has the best color gamut of any photo inkjet I've used and is a dead-on accurate proofer for CMYK print or grande format work. The Pro9000 uses C, M, Y, K, Photo Cyan, Photo Magenta, Red and Green inks. 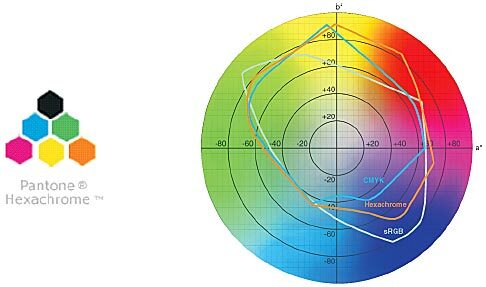 The physical differences between reflected and project light means that nothing can really replicate the RGB space on paper. That said, hexachrome printing can produce a larger color space than CMYK, and adding additional spot colors can increase it even further. Adding luminescent, fluorescent and reflective inks could help as well. I have seen this book in an exhibition in Brussels, It's offset inside and airbrush on the sides and the cover. Just by looking at the pictures, you can tell that the colors on the borders of the pages a far more saturated than the colors inside. Anyway, there is simply not any printing process that can reprocude all the gamut of even sRGB, or Adobe RGB. The Cyan (Pigment(s) Blue 15) and Yellow (Pigment Yellow 74) used in most pigment inkjet printers today, however, are out of the gamut of sRGB, they cannot be accurately displayed on a screen. If you want to get as close as possible to sRGB primaries, I suggest you use a printing process that allow you to have CMYK + a dithering of spot colors. For the Red I suggest a DPP scarlet, for the Blue a reddish-shade PB15 or a genuine ultramarine blue (PB29, greenish shade), or better, a mixture of PB15 and PB29. The most difficult color to imitate will be the green, but a good mixture of PY74 and PG7 will get you close. You can get a very very good white with PW6 (titanium white), with a reflectance of 97.5% if it's matte (L* value = 99! ), and you should find yourself a good jet black (it's hard to pass below 2.5% reflectance unless you use glossy paper). A combination of a CMYK process and those (dithered) spot colors should give you a far better gamut than a standard printer, especially in the dark values, where printing processes use too much black and desaturate colors. With IndiChrome you can apparently make custom inks to use as well, as you would with normal offset printers. They do Pantone matching and whatnot, so theoretically the sky's the limit. I'm not a shill for HP or anything; it's just that the printer we work with has Indigo presses so it was a familiar name to look into things. My point I guess is that this was digital offset and if I were to hazard a guess I'd bet the creator of this didn't go with custom inks, which means that a 6 or 7 color process could probably make this work. If so then CMYKOV or CMYKOVG might get it done! Not the answer you're looking for? Browse other questions tagged color print-design cmyk rgb or ask your own question. What is a spot/Pantone colour? How do you avoid bands of prominent color in gradients? Is there a printing press that can print a book directly from the RGB space?